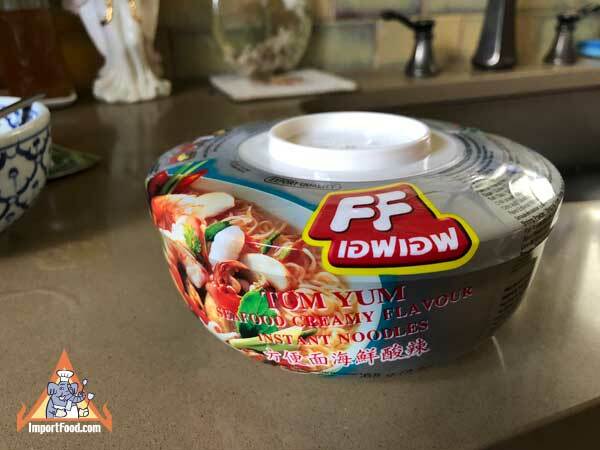 For years Mama brand has been the indisputed leader for instant Thai noodles, but we find this "Fashion Food" brand to have an amazingly delicious taste and quality. It's truly remarkable, not only the best flavor instant noodles we've ever had but also the most convenient packaging. Each pack looks like a little flying saucer, it's a bowl and a lid. Add boiling water to the noodles, mix in the three different spice packets, place the lid on the bowl and wait 3 minutes. Eat with the fork included. The taste is just wonderful. Everything about this says "Quality". Tom Klong is similar to Tom Yum flavor, hot and sour soup, but the herbs are roasted first which gives the soup a mild smokey flavor. We also offer Tom Klong flavor (below). Ingredients: wheat flour, palm oil, salt, sugar, galangal powder, msg, shallot powder, citric acid, onion powder. Product of Thailand. 65 grams per pack, a nice lunch for one person. Open the lid, smell the wonderful aroma, and enjoy! For years Mama brand has been the indisputed leader for instant Thai noodles, but we find this "Fashion Food" brand to have an amazingly delicious taste and quality. It's truly remarkable, not only the best flavor instant noodles we've ever had but also the most convenient packaging. Each pack looks like a little flying saucer, it's a bowl and a lid. Add boiling water to the noodles, mix in the three different spice packets, place the lid on the bowl and wait 3 minutes. Eat with the fork included. The taste is just wonderful. Everything about this says "Quality". Tom Klong is similar to Tom Yum flavor, hot and sour soup, but the herbs are roasted first which gives the soup a mild smokey flavor. We also offer Tom Yum Talay flavor (above) and You might like to try our our Wai Wai Tom Klong. Ingredients: wheat flour, palm oil, salt, sugar, galangal powder, msg, shallot powder, citric acid, onion powder. Product of Thailand.